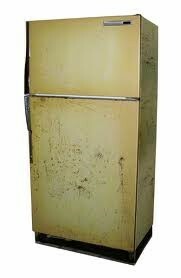 Your old fridge has quite an appetite for energy and PECO can help you. PECO will pay you $35 to recycle your old, energy-guzzling refrigerator. If you have an older, working refrigerator or freezer in your garage or basement, it may be costing you more money than you think. Did you know that it could use three times more electricity than a newer model, consuming nearly $150 in energy each year? • Pay you $35 per appliance for your refrigerator or freezer. • Have it hauled away for free. • Dispose of it responsibly—dismantling it and recycling its parts in an environmentally friendly way. • Between 10 and 30 cubic feet in size. *size is usually indicated on the side of the refrigerator or freezer door. • Empty and working at the time of pick-up. • Accessible with a clear and safe path of removal. The removal team will not risk injury, remove personal effects or modify your home (e.g. remove doors or railings) to remove the unit(s). Program funding is limited. Participation will be on a first-come, first-served basis until funds are exhausted.